There are multiple benefits in performing a diagnostic neck ultrasound examination prior to a thyroid nodule fine-needle aspiration (FNA). These benefits include confirming that a biopsy is required and determining the size and position of a nodule, which allows better selection of needle length and needle size. In patients with a multinodular goiter, ultrasound assures biopsy of the dominant nodule or the nodules most likely to be malignant—those having microcalcifications, increased vascularity, marked hypoechogenicity, blurred irregular borders, or other characteristics associated with malignancy. 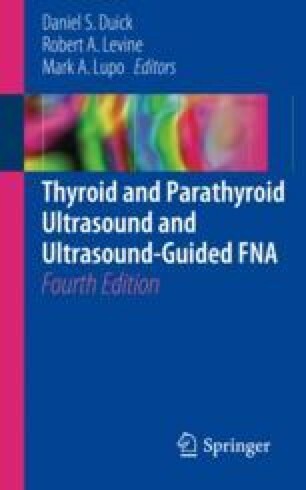 Finally, ultrasound may redirect the FNA to other areas of suspicion, such as an enlarged, suspicious lymph node or identify an incidental parathyroid adenoma. Once a physician acquires the skill to perform diagnostic neck ultrasonography, it is a simple progression to combine the two procedures into an ultrasound-guided FNA (UGFNA).